Remove the wheel and tire using power tool. Refer to WT-47, "Removal and Installation". 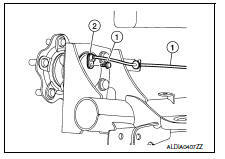 Remove the rear wheel sensor bolt (1) and the rear wheel sensor (2). Refer to BRC-107, "REAR WHEEL SENSOR : Removal and Installation". Remove rear brake drum. Refer to BR-42, "Removal and Installation". Do not depress brake pedal while rear brake drum is removed. Remove the hub bolts and wheel hub assembly. Do not remove parking brake assembly. Protect it from falling. Perform inspection after installation. Refer to RAX-8, "Inspection". Remove the rear brake caliper assembly. 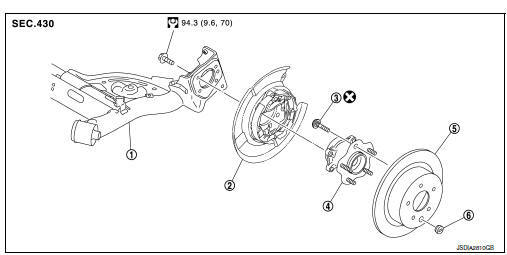 Refer to BR-47, "BRAKE CALIPER ASSEMBLY : Removal and Installation". Do not depress brake pedal while rear brake assembly is removed. Align the matching marks that have been made during removal when reusing the disc rotor. Check wheel sensor harness for proper connection. Refer to BRC-107, "REAR WHEEL SENSOR : Exploded View". Adjust parking brake operation (stroke). Refer to PB-4, "Inspection and Adjustment". Check wheel alignment. Refer to RSU-6, "Inspection".